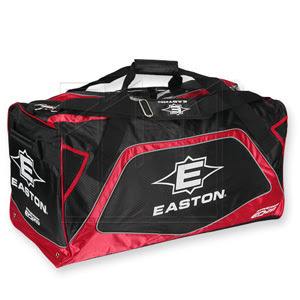 I recently purchased the Easton Synergy EQ20 Hockey Bag, (32'' Red). I play a few in a few ice hockey leagues and use it to tote everything to and fro. The bag had a lot of promise as it sports some pretty good looks like initially seemed to be very durable. However within the first month of usage, the bag's seam split underneath of where the shoulder strap is anchored. Seeing as though it hadn't been punctured by anything sharp, I can only conclude the manufacturing is shoddy. Additionally the bag doesn't have any large zippered pockets or even closing pockets on the sides. It had one measly zipper pocket on the inside that probably can hold your keys and wallet and that's it. Where are all my little things and tools supposed to go? Reccomendation: Do not buy this bag.